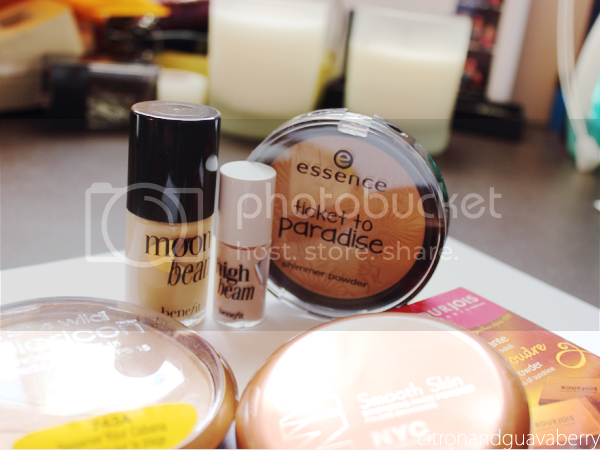 This is a partial collection, but most of my makeup is shown in this post (aka foundations + concealers not shown, + depotted items). Definitely not the largest collection, but definitely not the smallest either, heh. Now you guys know home shameful my Baby Lips collection is (I tell ya, they're the adult Lip Smackers!). I mean, some of you guys maybe already know about a majority of this stuff since most of my hauls are on here, but always nice to see everything in one place, eh? 1. Sally Hansen Triple Shine 'Pearly Whites' - FLAKIES. 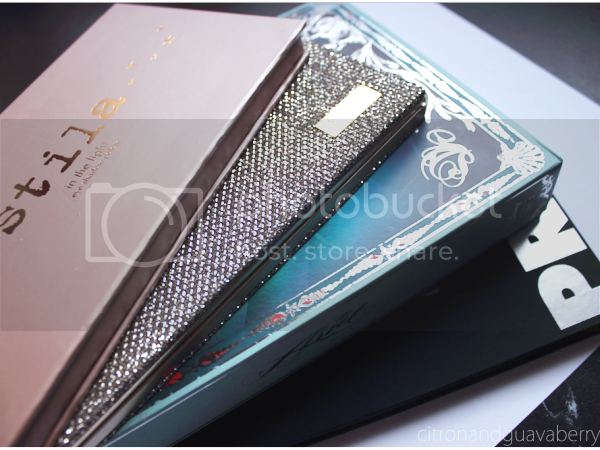 I am easily mesmerized by shiny things. 2. Soap and Glory 'Sugar Crush' - 'SUGAR CRUSH' ANYTHING AND EVERYTHING. One of my favourite scents, and if you don't know what it smells like, it basically smells like 'Sprite'/'7UP' on steroids (a very intense lemon/lime scent)(also, Chilsung cider...if you get the reference). 5. Lush Bath Bombs - expensive and impractical, but they make my room smell ~hallelujah~ for weeks. Bring on the citrus! 7. Josh Groban - I mean yeah, you technically can't buy people, so if someone could kidnap him and air mail him to me that would be great too. But if you don't want to risk an international fiasco over this ~beloved treasure~, feel feel to buy me his CDs. Annnnnd, I've finally finished Christmas shopping! I basically stash my makeup in my tiny tiny desk drawers right now. It's overflowing... so I need me some Muji drawers or whatnot. Stat! I love the picture of your baby lips in all their glory ;) And I am SO jealous of your lorac pro palette. I DEFINITELY recommend the real techniques stippling brush! I've used it almost every day since I got it a few months ago. OUUU, nice! Jealous that you guys have Real Techniques so easily accessible though! Haven't heard too much about it, but figured since Real Techniques does amazing brushes anyways + if you say it's amazing, then I need to get on this brush asap! Awesome pictures & collection! How do you like those Tarte cheek stains? Good luck with your exams, I just finished mine tonight! I like them, but I think you're 'just ok'. Messy though! 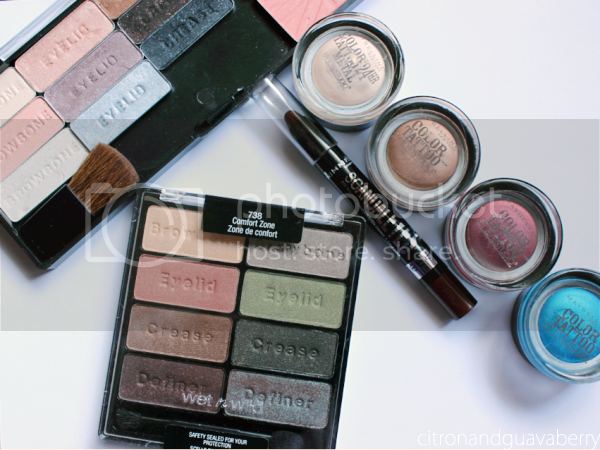 Omg, such a wearable and awesome collection full of versatile shades! I love all your blush picks, I'd wear ALL of them! And your baby lips collection is awesome! Mine, if I kept all of the ones I finished would include two of every color as I've gone through every color at least twice! 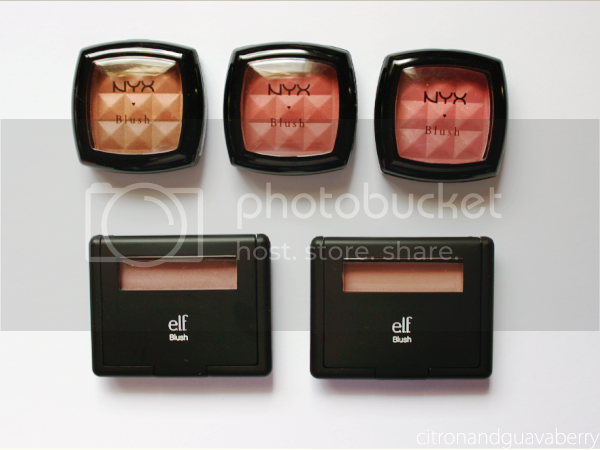 WE ARE BLUSH FIENDS, NO SHAME. I love the massive blusher stash and all of its glory! I want to try the Almay liquid lip balms; I see them everywhere. I have just managed to forget about them when I'm shopping...for like 5 months! Loved this post, your photography is so awesome gurl! GOODLUCK WITH THE REST OF YOUR EXAMS <3 YOU CAN DO IT!!! 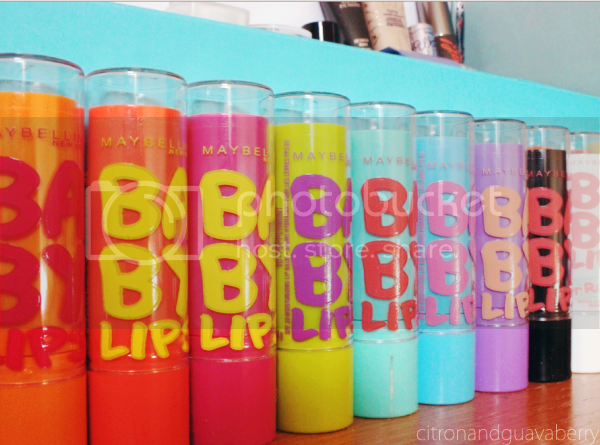 Wah so many baby lips omg, how do you know which ones to use! *-* I've used the Soap and Glory sugar crush things before and I love them so so much~ THAT SMELL OMG. I keep my currently using makeup in old ipsy bags in my drawer. 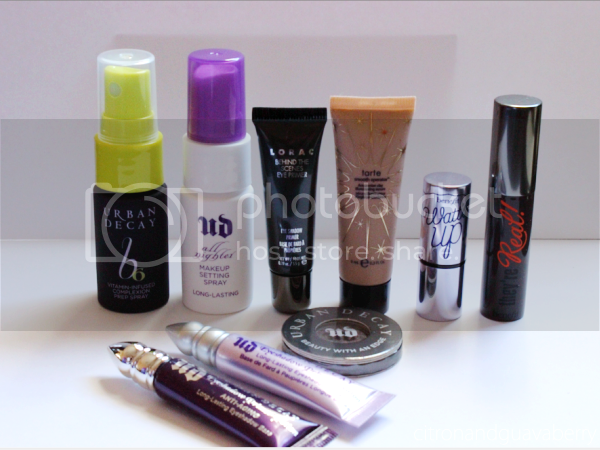 The make up I'm not using I keep in old Glossyboxes in my closet and then I rotate things in and out each month. I definitely would love some muji or ikea storage though. Wow you have quite a large make-up collection! I love how you have so many Baby Lips products as well! Hmm someone really likes blush and Baby Lips lol. Your makeup collection seriously puts mine to shame Vanessa. Everything I have pretty much fits into my clear acrylic organizer - well I make it fit anyway ;p I think I need a stippling brush as well but I kind of like the control of applying cream blush with my fingers. RYC: I ended up with a lot of new brands in my beauty gift guide because I've really been interested in natural/eco products lately. 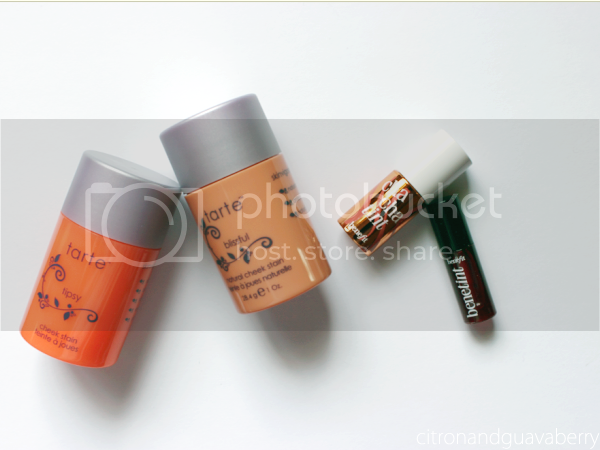 That Rouge Bunny Rouge blush stick is so covet worthy and it comes in the prettiest shades as well. Acrylic holders seem to be the standard solution, eh? 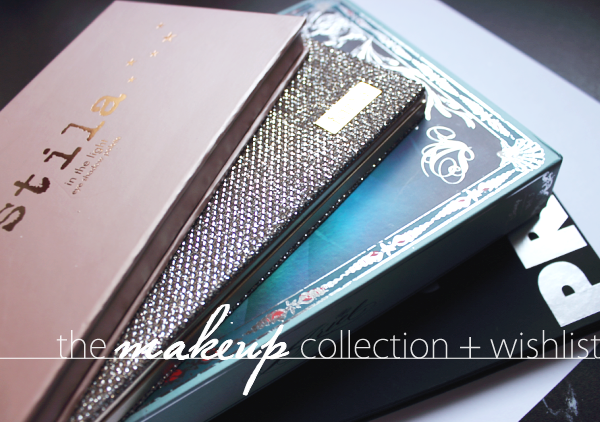 LOVE your makeup collection (and I'm totally digging the pictures as well). 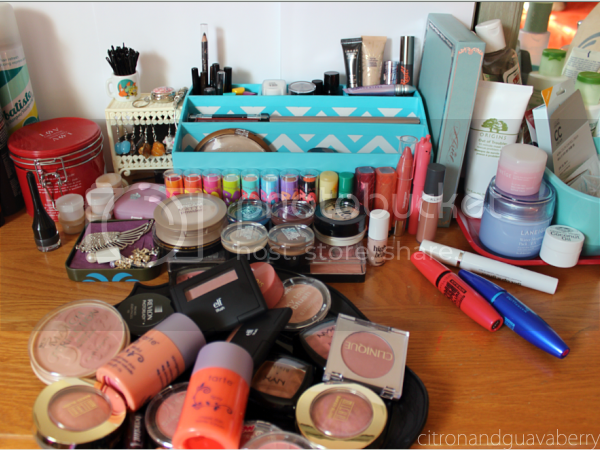 If my makeup was as prettily disorganized as yours was it would be awesome! (but alas, mine is tucked away in a couple of drawers somewhere in my room!) 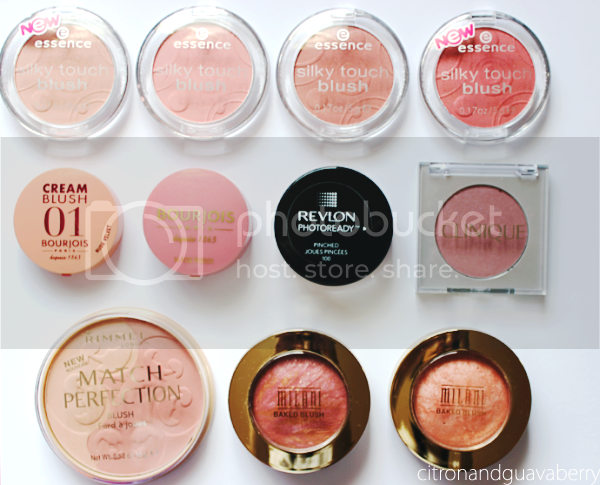 but HOLY MOLY I want that blush collection...!!! Nah, mine isn't that greatly organized though! hahah josh groban. i use to be so in love with him! what a great collection and holy baby lips! i can't wait to try out the medicated ones. i love the blushes you have! Great collection and loved your post! P.S - I absolutely love the header - you're very talented! Heh, Soap and Glory is quite pricey here in Canada, ain't it? I might splurge on them one day! now that's a vanessa table! i laughed so hard when I saw another baby lips on your wishlist!! and btw i really like that black plate that you are using on your pics lately. Hehehehe, nice call on the plate! IT'S FROM TARGET. HALLOWEEN EDITION. Nice collection! I always hear people raving about the Baby Lips, but I've actually never tried them myself. Storing make-up is seriously impossible to me, every time I put everything back in its place, it only takes me a few days to mess it all up again because I need something at the bottom of the stack XD Impossible. Ahhh, they're not really anything special, but I love the scent + they're too cute! You have quite a collection of baby lips! 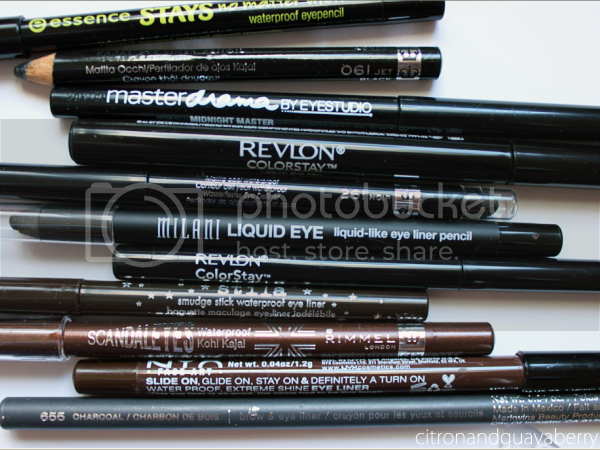 Oh btw, you'd be the perfect person to ask this question since you seem to have tested a lot of them---which drugstore brand in your opinion makes the best liquid eyeliner? NOOOOOOO LOL. Everyone seems to ask me this question but I am probably the least qualified, haha. I've only ever tried 2 liquid liners, so I definitely need to try out more in 2014! Love your collection!! I store mine in a 3 drawer organizer i found at Target. It was $15 i believe. I love it, but its starting to overflow in my palette section .__. 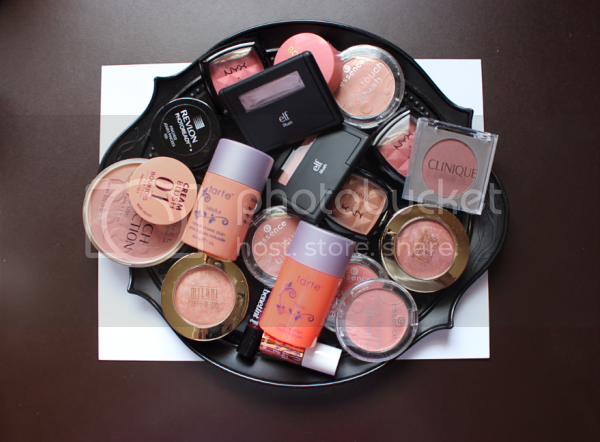 also I'd love to see individual posts on all of the "categories/sections" of your makeup collection! osnap I GOT CALLED OUT. P.S. I hope your exams went well!